Syphax Airlines (Sfax, Tunisia) yesterday (July 30) announced it had suspended all operations from Tunisia. The company was launched in 2011 by Mohamed Frikha, CEO of TELNET Group, Syphax Airlines is a limited company. The airline commenced operations on April 21, 2012 as previously reported. Syphax was based at Sfax Thyna, and its network consisted of international destinations, mainly to France and Turkey. Tunisia has seen a dramatic drop in tourism after it suffered severe blows following the Bardo National Museum attack and the Sousse attack in 2015. Copyright Photo: Christian Volpati Collection/AirlinersGallery.com. Airbus A319-112 TS-IEF (msn 3853) wears a special livery as the “Official Airline of the Carthage Eagles”, the Tunisia national football (soccer) team. This entry was posted in Syphax Airlines and tagged 3853, 50th Airbus A320, A319, A319--14, A319-112, Airbus, Airbus A319-100, Sfax, Syphax Airlines, TS-IEF, Tunisia on July 31, 2015 by Bruce Drum. Syphax Airlines (Sfax, Tunisia) will launch weekly Airbus A330-200 service between Tunis and Montreal (Trudeau) on April 25. It will be the first long-haul route for the young carrier. Copyright Photo: Syphax Airlines. Airbus A330-243 TS-IRA (msn 345, ex F-WJKG) was acquired on June 20, 2013. This entry was posted in Syphax Airlines and tagged 345, A330, A330-200, A330-243, Airbus, Airbus A330, Airbus A330-200, Montreal, montreal trudeau, Syphax Airlines, TS-IRA on March 17, 2014 by Bruce Drum. 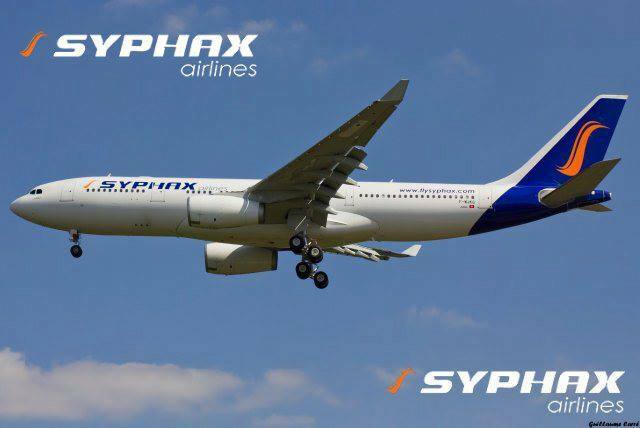 Syphax Airlines (Sfax) has signed a memorandum of understanding (MOU) to acquire three Airbus A320neo aircraft. The order is the first time an African based carrier has ordered the NEO and marks a significant breakthrough for Airbus in one of the world’s fastest developing markets. Syphax have also ordered three A320ceo aircraft. The aircraft will be powered by CFM engines. The airline already operates two Airbus A319s and three A320 aircraft and will shortly commence operating a leased A330-200. This entry was posted in Syphax Airlines and tagged A320, A320-200, A320neo, Airbus, Airbus A320, Airbus A320-200, Airbus A320neo, Syphax Airlines on June 19, 2013 by Bruce Drum. 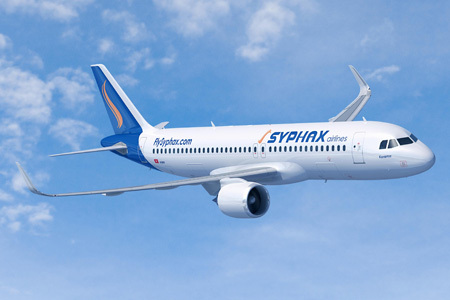 Syphax Airlines (Sfax) has ordered three Airbus A320neo and three Airbus A319/A320ceo aircraft. The airline will take delivery of its first A320ceo in 2015, while the new A320neo aircraft are schedule to begin delivery in 2019 according to CFM International. The airline will also add its first Airbus A330 in April 2013 for new long-range routes to China, Canada, South Africa and the United States. Copyright Photo: Jacques Guillem Collection. Airbus A319-112 D-AHIN (msn 3853) became TS-IEF with the carrier. This entry was posted in Uncategorized and tagged 3853, A319, A319100, A319112, Airbus, Airbus A319, Airbus A319100, Airbus A330, aviation, DAHIN, Syphax, Syphax Airlines, transportation, TSIEF on January 16, 2013 by Bruce Drum. Syphax Airlines (Sfax) is planning to fly to Tunis-Carthage International Airport starting on April 29. Tunisair is protesting the plan to serve the capital. The flag carrier was OK with permitting the new Tunisian airline to develop the region around Sfax, but not Tunis. 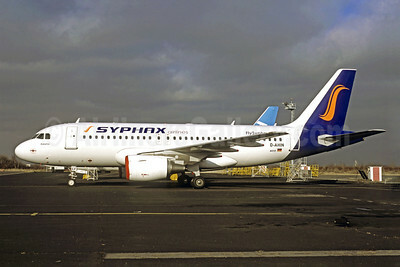 Syphax Airlines launched operations on April 14 from Sfax with two Airbus A319s. It currently serves Paris (CDG) and Lyon. Copyright Photo: Jacques Guillem Collection. This entry was posted in Syphax Airlines and tagged 3853, A319, A319100, A319112, Airbus, Airbus A319, Airbus A319100, DAHIN, Syphax, Syphax Airlines, TSIEF on April 24, 2012 by Bruce Drum. 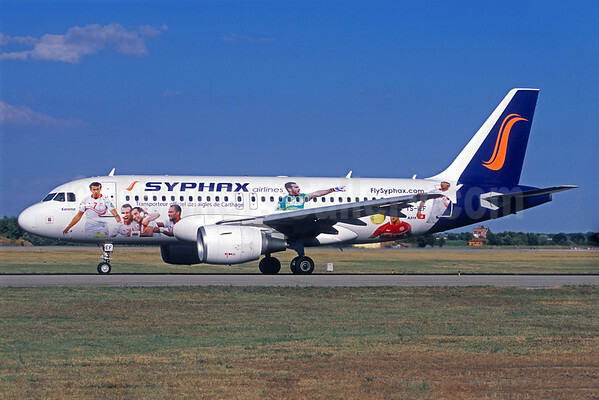 Syphax Airlines (Sfax) as we previously reported, is a new airline in Tunisia founded by businessman Mahmoud Frikha. The new carrier is based at Sfax–Thyna International Airport (IATA: SFA, ICAO: DTTX). During World War II, the airport was known as Sfax Airfield and was used by the United States Army Air Force Ninth Air Force using B-25 Mitchell bombers during the North African Campaign. Doric Asset Finance this month delivered two former Hamburg International Airbus A319-112s to the new Tunisian airline. A319-112 TS-IEF (msn 3853, ex D-AHIN) was handed over on March 14 and is named “Karama”. This was followed by A319-112 TS-IEG (msn 3872, ex D-AHIO) on the following day. remarketing agent for two German funds from the Hamburg-based investment house Woelbern Invest. remarketing activities arranged by Doric. Syphax Airlines is planning to launch its operations this month from Sfax Airport to destinations in France. Copyright Photo: Doric Asset Finance. This entry was posted in Syphax Airlines and tagged Syphax Airlines on March 25, 2012 by Bruce Drum.